Like most people who grew up having stories read to them at some point one of those stories was Peter Rabbit. My mom loved these stories and that love came through whenever she read them to me growing up. I strongly believe that these books fostered my deep love of rabbits. When I had a petite of my own, my old Beatrix Potter books came to reside on her bookshelf – from time to time we would read the stories of those mischievous little rabbits. When I heard that Emma Thompson was going to be writing The Further Tale of Peter Rabbit , I was excited, but nervous all at the same time. You see, I love Emma Thompson – literally everything about her, she seems like she is just the most fun. 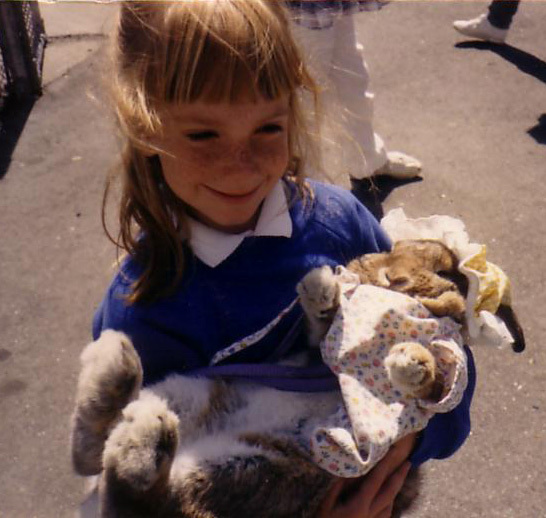 However, I was nervous, because I had such fond memories of Peter Rabbit and I was a little scared of change you see. Let me be the first to say, The Further Tale of Peter the Rabbit is AMAZING! First of all the letter from Ms. Thompson in the beginning of the book is quite adorable. Not to mention this story is incredibly fun, the illustrations are lovely. My absolute favorite is when Finlay McBurney shows up, he is a rather large Scottish rabbit, complete with kilt, dagger and thistle tucked into his coat. Peter is challenged by Mr. McBurney to some games of the Highland variety. Of course our pal Peter is as mischievous as ever and puts his paws where they shouldn’t be, it is a great story, with a very sweet message. This book is engaging and charming from the very first to last page. I am certain that if you fondly remember Peter Rabbit, you will be delighted to embark on this new adventure with him. And fortunately there are three adventures to add to your shelves. ← Kisses are Flying in Catching Kisses. So we pulled out my Beatrix Potter books for Emma, and Jemimah Puddleduck was kind of horrifying! We will definitely check these out. Yes, some of the books are a little violent and terrifying, this is not the case with the Emma Thompson version at all. They are a lot more softer approaches to lesson learning and moral teaching.